Monday - Because of fires in Colorado, we've had to take an alternate route for a few days, remaining in New Mexico a little longer before going north again into Colorado. 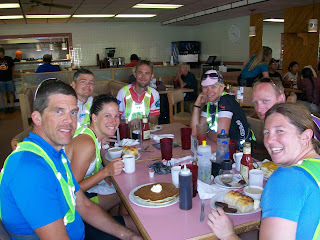 Today was a pretty easy day -- only 90 km, so my group stopped at a cafe about halfway for a second breakfast. 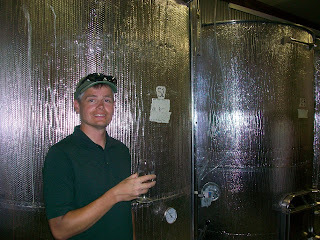 Tonight we're staying at a Winery which provided tours for us during the afternoon. Of course, alcohol isn't allowed in camp so I had to pour that glass back into the tank. Looks like a delicious second breakfast! Did you also stop for elevensies, luncheon, afternoon tea, dinner, and supper? Yes, though normally they consist of a PB&J sandwich or a granola bar and some water on the side of the road.